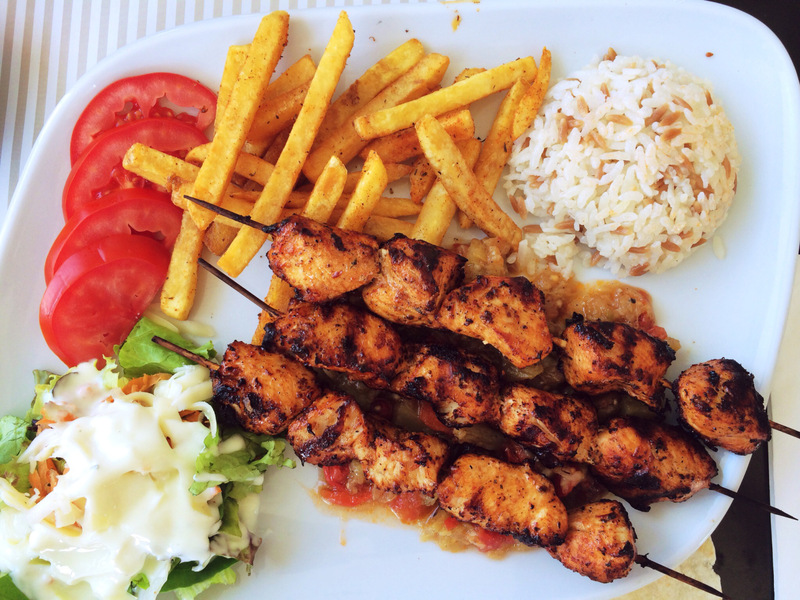 Turkish cuisine is a blend of savory, succulent, sugar-coated goodness. 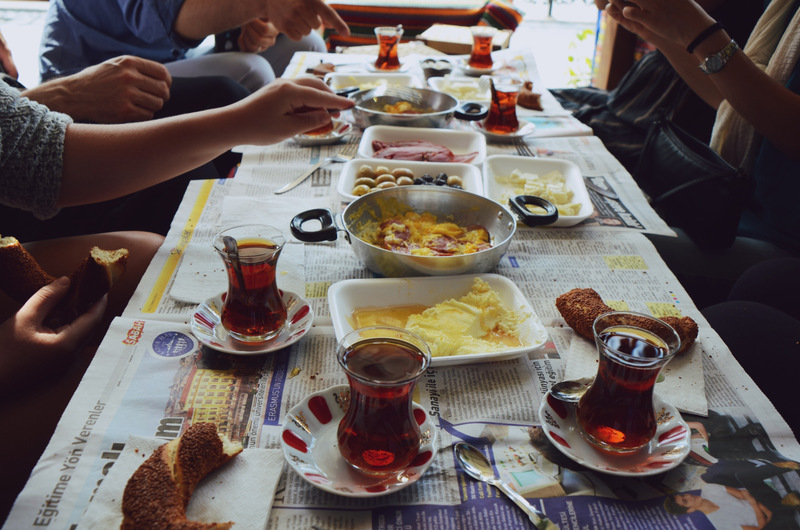 Due to Turkey’s location between Eastern and Western powers Istanbul is a confluence of civilizations culturally, linguistically, and gastronomically. Think of your favorite ethnic foods. Greek food is defined by rich cheeses, olives, and marinated meats. Travel further south to Egypt where you’ll indulge in garlicky hummus and falefel wrapped in warm pita. Turkey draws from all of these traditions while contributing its own edible creations. After eating incredible food every day for the past month I wanted to put together a list of the 10 ingredients most commonly found in Turkish cooking. Read along and grab a napkin in case you start drooling. 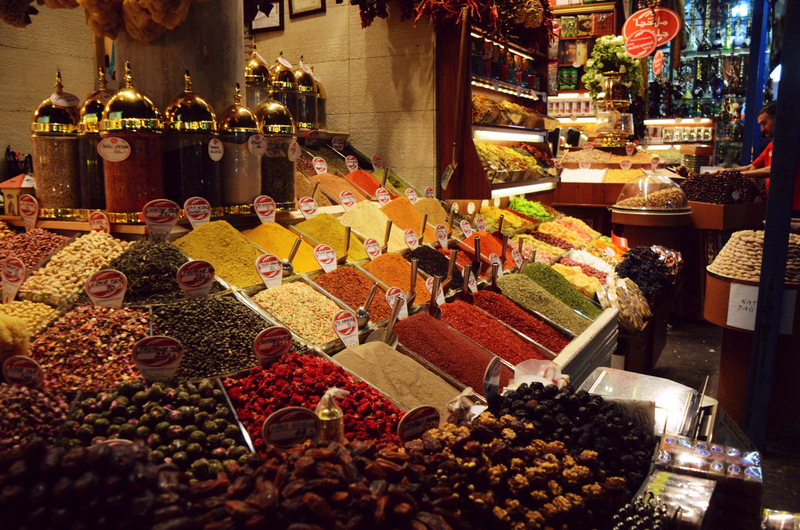 When I first told my brother that I was going to be living in Turkey he smiled and said “sis, you have to promise to bring back some cinnamon.” When our family traveled to Turkey five years ago we wandered aimlessly through the spice market in awe of the mounds of spices unknown to our taste buds. In an attempt to sample the local flavors we purchased a bag of cinnamon. When we arrived home I whipped up a batch of cupcakes with a dash of Turkish cinnamon in the batter. My family and I felt like we had been introduced to a whole new spice. And we had been. The cinnamon sold in the United States is called ceylon and is extracted from the shoots of the plant prior to maturity. Turkish cinnamon, which is called cassia, is made by grinding the cinnamon bark. Cassia cinnamon is rich and aromatic compared to drab ceylon. Being a food historian I’ve delved into the history of these ingredients to give you a more robust read. In the Middle Ages the Arabs had a monopoly on cinnamon which made it extremely expensive. Those in the upper class sought luxurious goods that would complement their social rank. These individuals imported spices such as cinnamon to showcase on their tables. In order to boost prices Arab merchants teased consumers with outlandish tales about the origins of their cinnamon. Herodotus (the first historian) wrote that huge birds transported cinnamon sticks to their nests which were located on a mountain so high it could not be climbed by humans. The merchants supposedly lured the birds down with ox meat and when they approached the birds would drop their cinnamon sticks. Fortunately, cinnamon is not found atop a rocky outcrop inhabited by pterodactyl-like creatures. Today cassia cinnamon is produced in Sri Lanka and exported to Turkey. 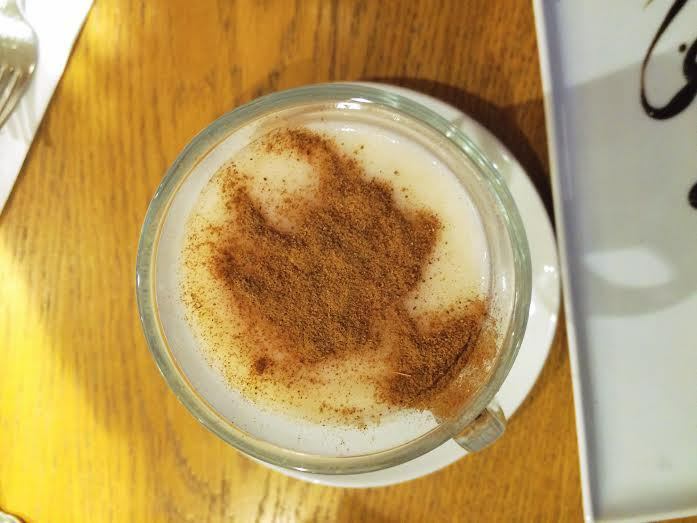 Cinnamon is most commonly used on Turkish salep, a winter drink made with hot, frothy milk and sweetened with orange, rosewater, and cinnamon. Salep is generally a winter drink but I was able to taste some tonight in a bakery and it was divine. I had Mia and Aisha try it as well because I found the taste difficult to describe. The closest description we got was “warm milkshake” but I would say a milkshake is far sweeter than this drink. It tastes like a white hot chocolate with hints of orange and rose. Hands down kaymak is my favorite Turkish food. It reminds me of sitting with my mother at a cafe in London, spreading clotted cream and jam on a piping hot scone. But make no mistake, kaymak is not English clotted cream. 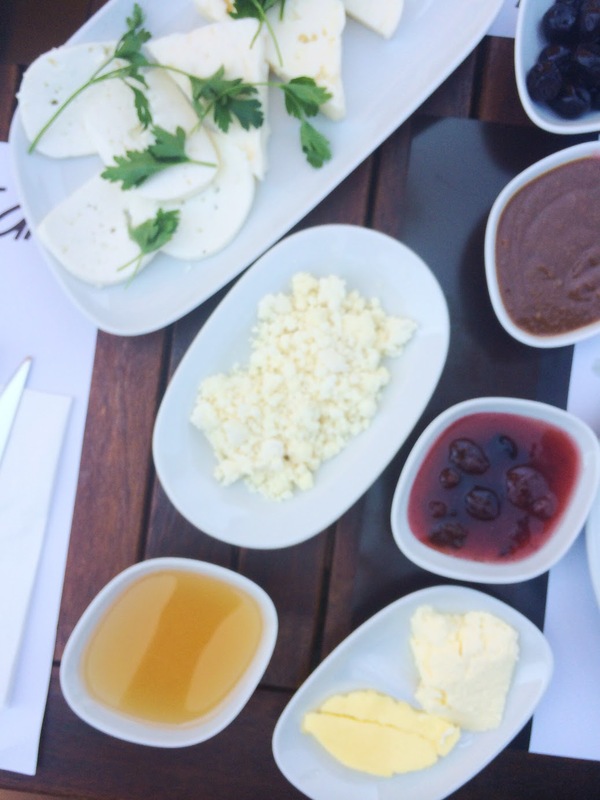 Although clotted cream is an English invention kaymak has found its own place on the Turkish breakfast table. Turkish clotted cream is made with domesticated water buffalo milk. That’s right. Some guy has a farm of water buffalo bred specifically to produce this stuff. The specific buffalo that make the cream are called manda in Turkish. I have a special spot in my heart for water buffalo so it’s no wonder I could live off of kaymak. I’ve found that it’s extremely difficult to explain clotted cream to someone that has never tried it. 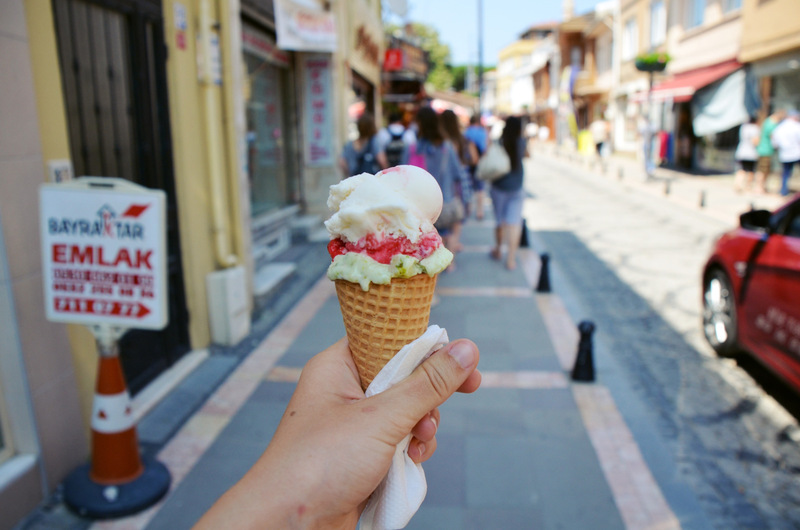 Kaymak is similar to milk but less of a liquid, and somewhat like whip cream but more solid and sweeter. Think sweet, whipped butter. 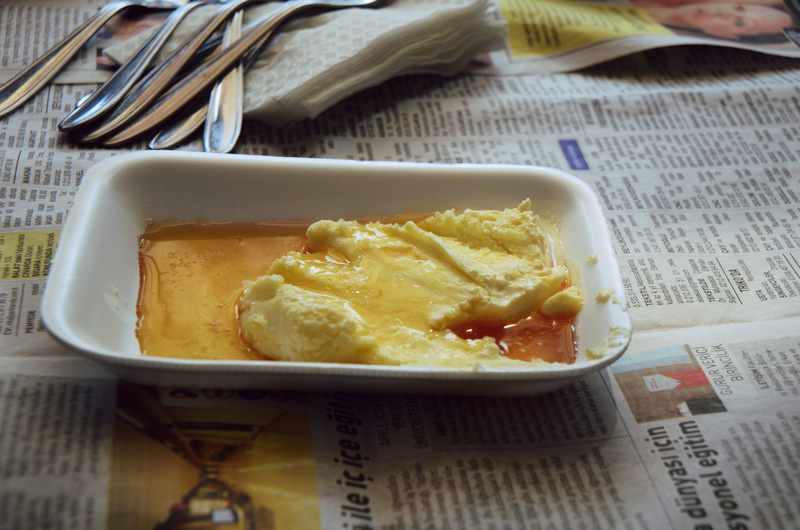 Kaymak is made by boiling buffalo milk and then simmering it over low heat for many hours. Once cream starts to form it is skimmed off the top and refrigerated. The cream ferments slightly to give it a sour taste. The cream keeps for a mere day so it must be consumed immediately. Did I mention kaymak is 60% fat? Yeah, it’s heavenly. 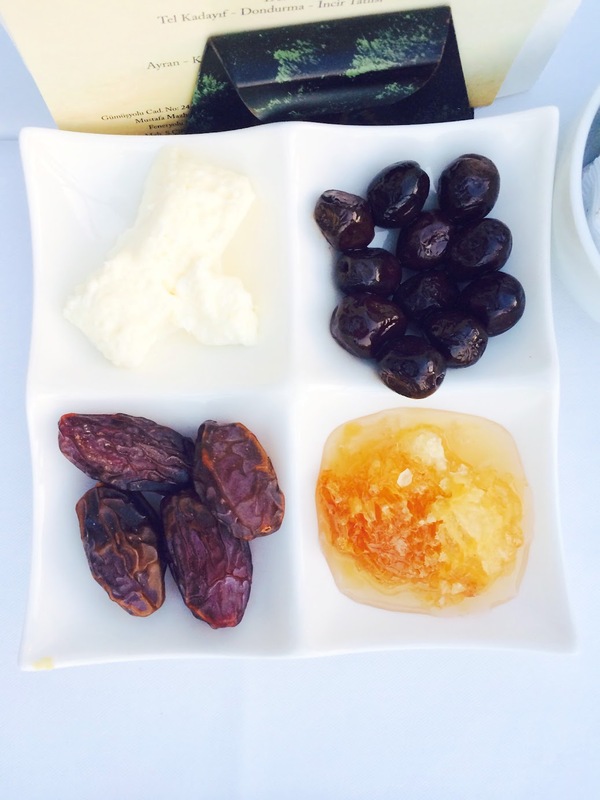 Kaymak is always served in a traditional Turkish breakfast and is best paired with sour cherry jam and honey on fresh Turkish pastry. 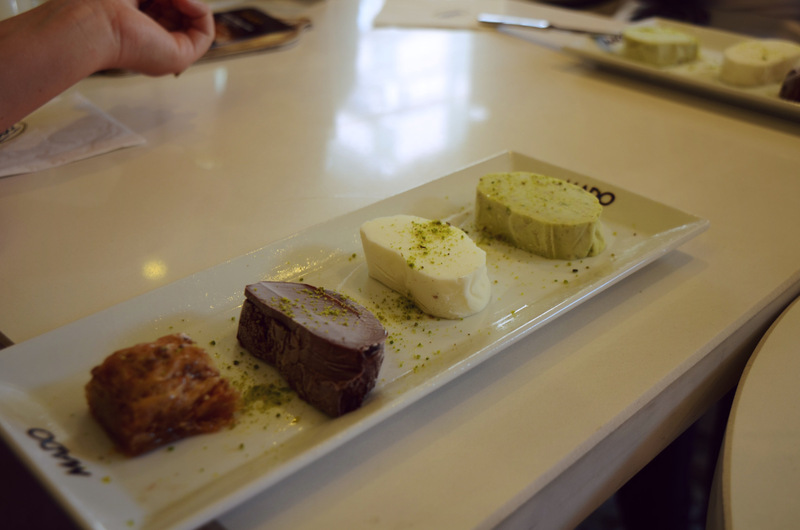 There is also a dessert called ekmek kadayıfı which is a cake with layers of clotted cream. I still need to try that one! 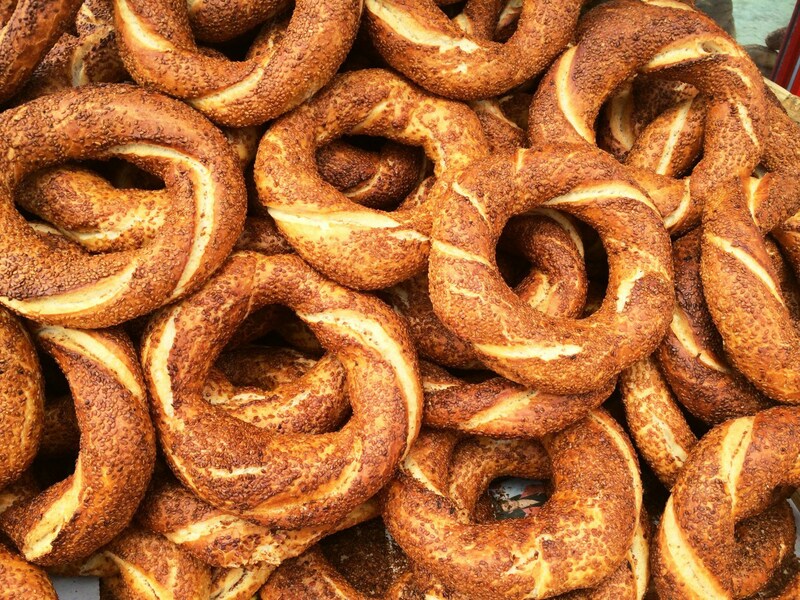 This is where Istanbul’s Greek roots come into play. Cheese is a Turkish staple but the only kinds I have been exposed to are mozzarella, goat cheese, and feta. Feta cheese is served at every meal and accompanies nearly every dish. Ordering kebap at a restaurant? Feta. Chicken wrap? Feta. Side of fries? Feta. The feta here is more creamy than crumbly and is made from sheep’s milk. I love taking a wedge and putting it on a tomato or cucumber in the morning. According to Homer, Polyphemus was the first to make feta cheese. If you’ve read the Odyssey you’ll recall that Polyphemus was a cyclops who also herded sheep. He stored milk in sheep’s skin but he left the milk in the bag for too long and when he looked inside the milk was curdled. Although the history of feta is obscure this is actually the leading theory for the origins of cheese andyoghurt. Storing milk in animal hides allows the liquid to interact with bacteria in the stomach lining to transform it into something new. The Turks still employ this tactic today when making cheese. On the streets you can spot large animal hides that house cheese in the making. The first written record of feta cheese comes from the Byzantine Empire, so it may have origins in modern day Turkey rather than in Greece. However, the word feta comes from the Italian fette “to slice”. Regardless of where feta originated, you can’t beat a thick slice of cheese on a seasoned tomato wedge. they’re making cheese in there! I have never been a fan of tomatoes. I’ve grown them in our garden, I’ve sauteed them with, piled them on noodles, thrown them on salads. I cannot get into tomatoes. This changed when I came to Turkey. The tomatoes are so large you need to use both hands to hold one. They are also a deep red color all the way to the core and there is less gooey jelly inside. 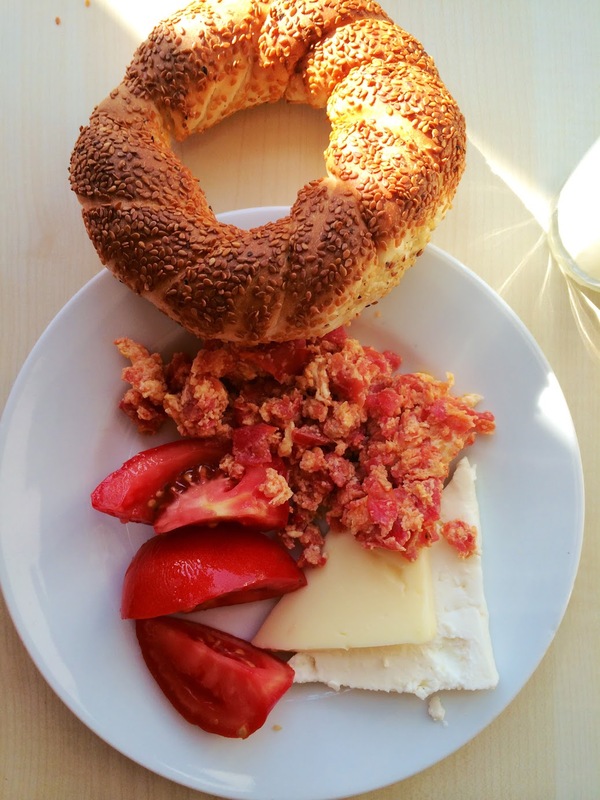 All meals in Turkey come with a sliced tomato on the side along with a wedge of feta. Sometimes the tomatoes are grilled but they are usually raw. These tomatoes are rich and sun ripened and they go well with every Turkish chicken dish that I’ve tried. I may now be on team tomato. 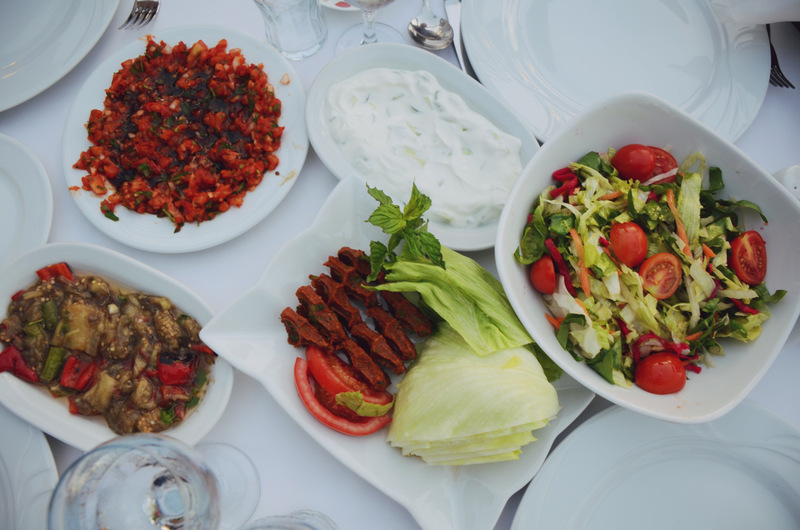 Tomatoes only appeared in Turkish cuisine in the late 1800s. However, they have quickly found a home nestled into kebap andtantuni. Red tomatoes are almost always be found on the table whereas green tomatoes are used for pickling. The Turks use tomatoes in soups, salads, and delicious sauces. I wrote about this earlier, but there is a famous Turkish saying that happiness is “a dish cooked in tomato paste by a woman with big hips”! 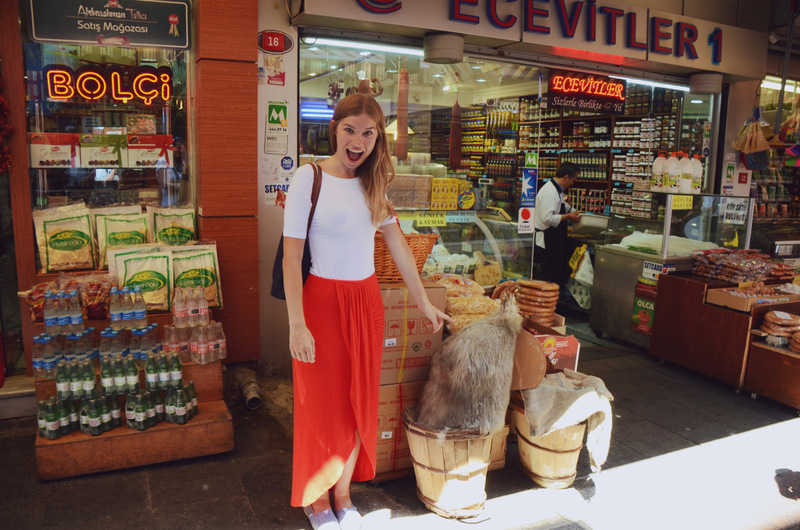 The spice market is full of mounds of tomato paste and I wish I could take a whole bucket through customs! Pistachio may be the most Turkish of all the ingredients on this list. Pistachios are native to the Middle East and archaeological evidence suggests that they were eaten in Turkey in 7000 BCE. Muslim legend claims that pistachios were brought to earth by Adam from the Garden of Eden. I think it’s safe to say the Turks take their pistachios very seriously. Pistachios have been used medicinally for toothaches and liver problems. Like trail mix today, pistachios were a common food eaten by travelers because they have a long shelf life and are easily transported. And did you know? Pistachios are not nuts! They are actually seeds that look like nuts. 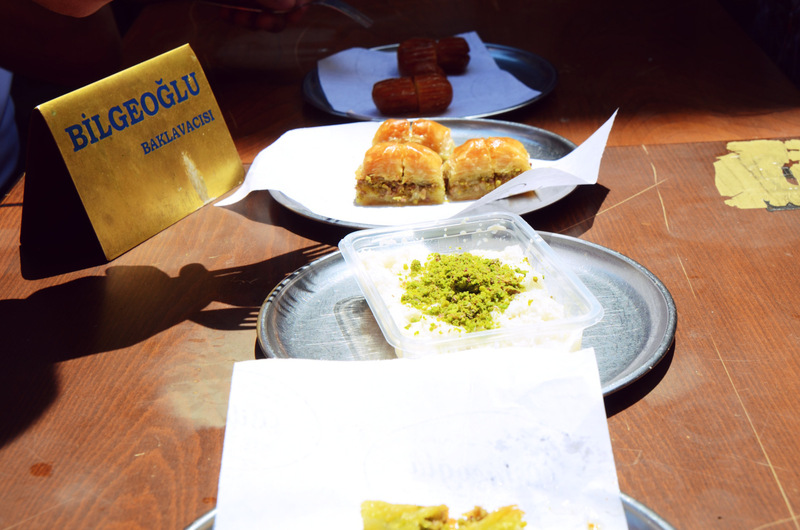 Pistachios adorn most Turkish desserts. 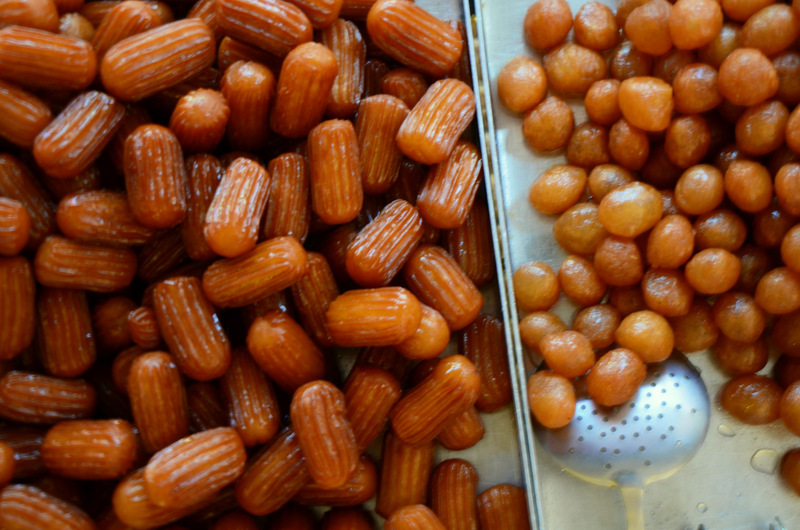 They are commonly sprinkled on top of baklava, cakes, and pudding. 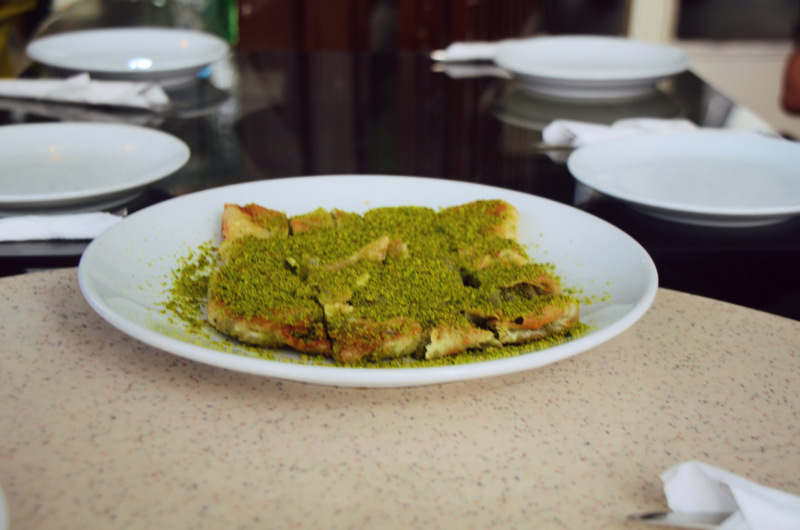 Pistachios are also the key ingredient in katmer, which is essentially a fried baklava. Clotted cream and pistachios are wrapped in philo dough, fried, and topped with butter and more pistachios. I’m not sure how I’ll ever be able to eat American food again. When you eat something with rosewater the word “exquisite” comes to mind. Rosewater is the delicate, sweet kiss at the end of a Turkish delight that makes you feel like a Byzantine princess. (Note: this is a terrible analogy, Byzantine princesses were married off as child brides or exiled to remote islands. Eat rosewater-flavored foods but don’t become a Byzantine princess.) Rosewater is made from the process of distilling rose petals. Rosewater is downright romantic. 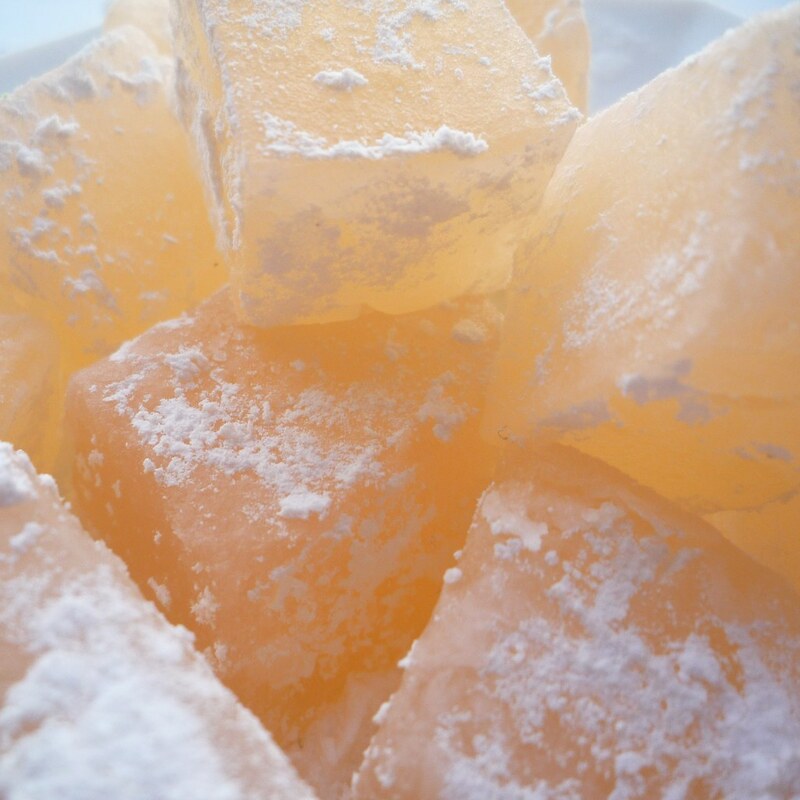 It gives sweets a subtle hint of rose and the taste gets stronger with each bite. Rosewater livens up dairy dishes like yoghurt and milk as well as desserts such as rice pudding and cakes. Putting a hint of rosewater in a dish gives it an extra dimension that is both elegant and fragrant. The word sesame comes from the Arabic simsim and was widely used by Muslim empires. The Assyrians had a myth that the gods had drank sesame wine before they created the earth. The Egyptians ground sesame seeds to use as four and in 5000 BCE people in China burned sesame oil to make soot for ink blocks. Sesame was believed to have mystical powers as evidence from the expression “open sesame” in the Arabian Nights. As we hiked down a steep, uneven cobblestone road in Assos I stopped part-way down to catch my breath and noticed a conveniently located coffee shop. I sat down with our program director and one of our professors and they ordered Turkishkahve with mastic. 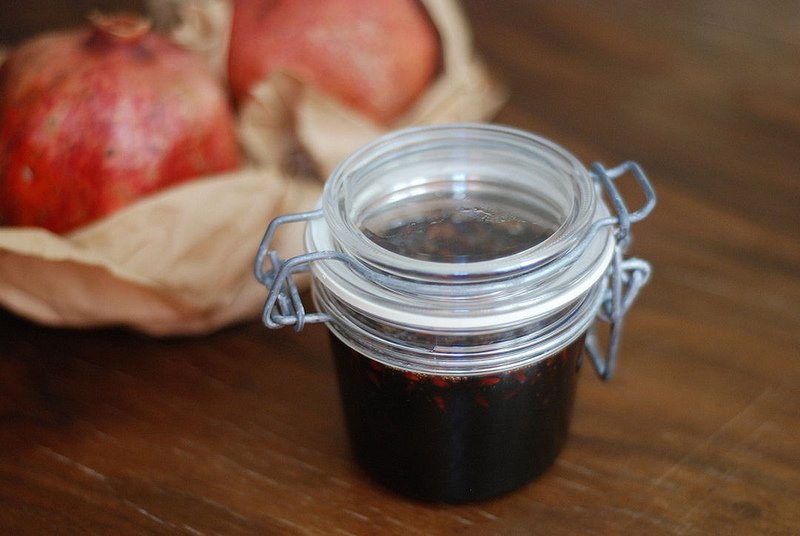 In Assos, a few hundred kilometers South of Istanbul, mastic flavoring is very popular. Mastic is a resin that comes from an evergreen tree that grows on one Greek island called Chios. Mastic has a slippery texture and tastes like a mix of olive oil and mint. Mastic makes Turkish coffee go down smoother and it softens the taste of the bitter coffee granules. Because it is so refreshing mastic has been renowned for its ability to reduce plaque. The resin was popular among women in the Ottoman harem because it gave them fresh breath and white teeth to impress the Sultan. 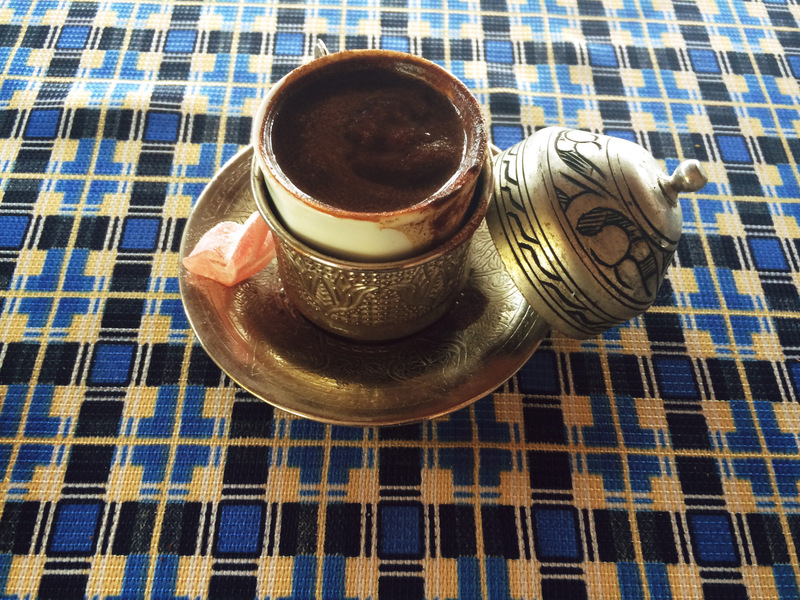 About half the Turkish coffee shops I have visited offer coffee with mastic but it is also common in ice cream, pudding, and Turkish delight. Pomegranate is perhaps the most popular Middle Eastern fruit. Native to Iran, pomegranate has been eaten in this region since 3000 BCE. Pomegranates are also said to have been the favorite fruit of Muhammad, which only serves to increase their popularity. Even King Tut was buried with pomegranates in order to ensure his passage into the afterlife. And you know if King Tut was into pomegranates they must be something special. The Ottomans used pomegranates as a stand in for lemons. 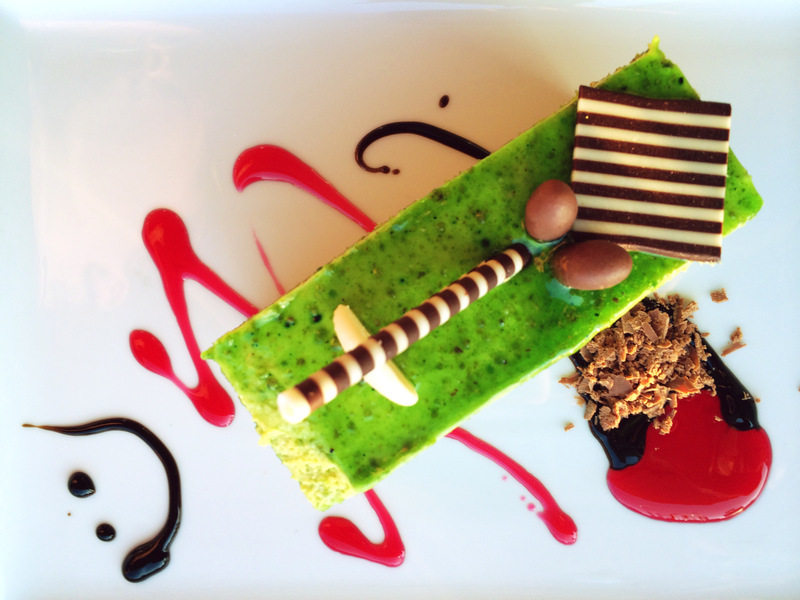 Like the pistachio, pomegranates are used as embellishment on Turkish desserts. I’ve mainly eaten them scattered over pastries. I’ve also heard from many Turks that pomegranate jam is the most heavenly thing on this planet. Every time I to into the city I find a jam shop, pop in, and ask nar? But the answer is always no. One day I will find this allusive pomegranate jam! I had never eaten sour cherries until I came to Istanbul. 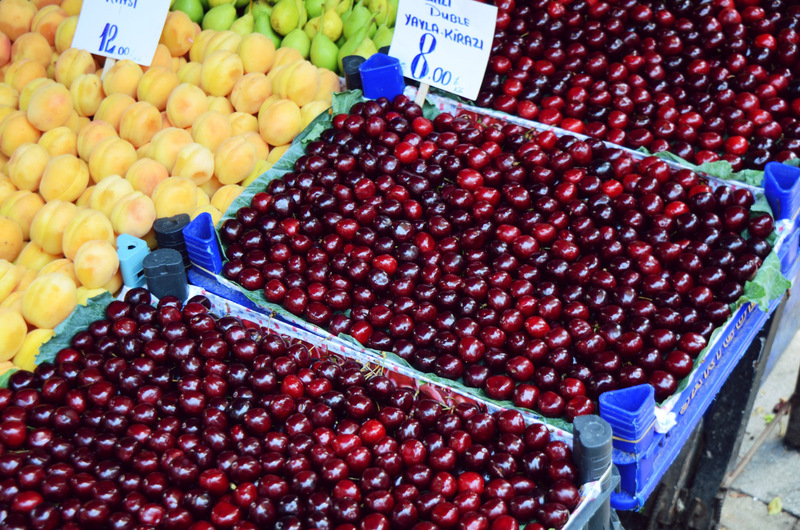 Sour cherries are different from regular cherries and they’re sold side by side in open air markets. Sour cherries are smaller and a darker red color and, as their name suggests, are tart compared to normal cherries. Their season is from June to August which means we currently have access to the best sour cherries. 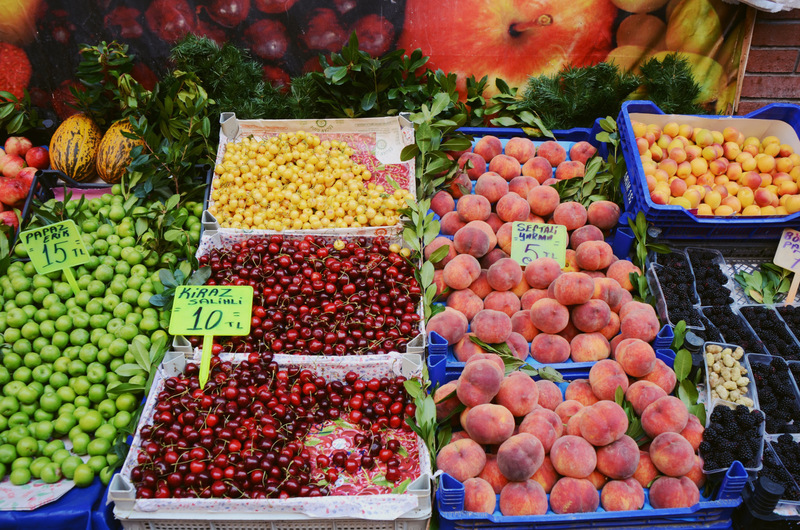 Turks are so enamored with this fruit that they preserve it and make jam so they can eat sour cherries year round. On campus we drink sour cherry juice everyday. Sour cherries are also used in rice dishes and in stews. 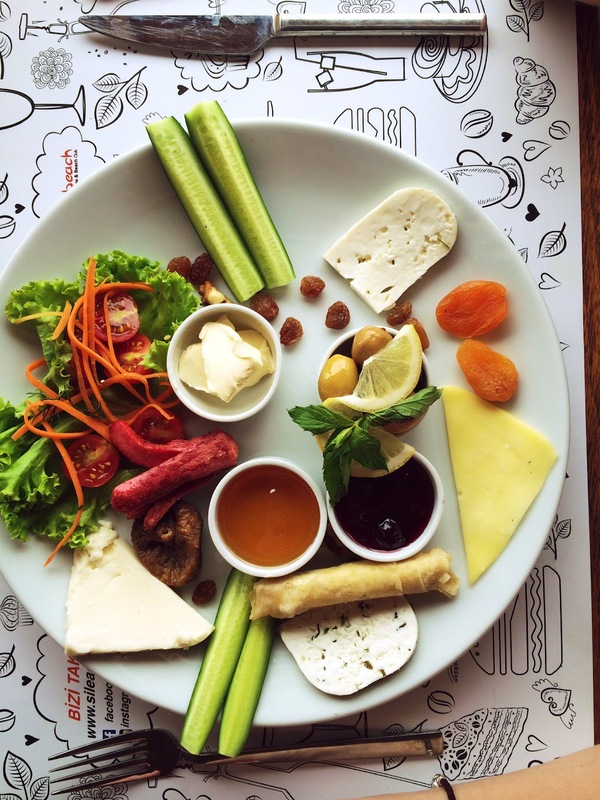 The Turks aren’t afraid to mix their sweet and savory.